SharePoint Designer provides an intuitive interface for the underlying SharePoint platform and a staggering range of development possibilities. You can, of course, develop and configure sites, pages, lists, and libraries, but you can also go deep into advanced functionality, including building custom page layouts, developing workflows, and creating branding (just to name a few). Aside from using the browser, SharePoint Designer is one of the most useful tools for developing on the SharePoint platform — and a place you are likely spend a great deal of time. To exercise all its well-muscled capabilities, SharePoint relies heavily on another Microsoft product: SQL Server, a database application that’s designed to store data. In the case of SharePoint Online, you don’t need to worry about this product, but should at least be aware that SharePoint is using a database to store content and configuration data. Microsoft takes on the burden of supporting the infrastructure to SharePoint (including SQL Server). All you have to do is use the final product. The SharePoint platform stores its content and configuration information in a number of SQL Server databases. Because those databases hold all the crucial goods, you can’t just crack open Windows Explorer and start looking at files in SharePoint. You need a tool that allows you to peer into the databases and work with the SharePoint platform. SharePoint Designer is just such a tool. Press the Windows key and type SharePoint Designer into the search box. Click Start→All Programs→SharePoint→Microsoft SharePoint Designer 2010. When you open SharePoint Designer, the Backstage View appears. 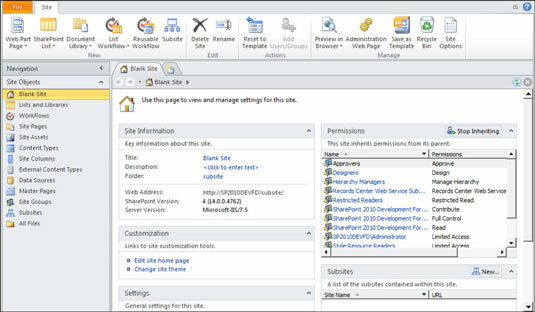 Because SharePoint Designer is designed to work only with SharePoint, you must connect SharePoint Designer to an existing site or create a new site in an existing SharePoint environment. If you’ve already connected to a site, then that site shows up in the Recent Sites section — you can simply click the name of the site to connect and start developing. After you connect to a site, the Ribbon activates, the navigation comes to life, and you have all the SharePoint Designer capabilities at your disposal. You can use SharePoint Designer to work with SharePoint. Because SharePoint stores all of its content and configuration information in a database, it would be very difficult to modify the database directly. What you need is a logical window into the database in order to work with SharePoint. SharePoint Designer is a tool specifically for the task of connecting to the SharePoint database to provide you with the ability to perform development tasks. You can develop a horde of SharePoint components. Develop pages, lists, libraries, data sources, content types, views, forms, workflows, and external content types — all without having to write any code. SharePoint Designer spans a large swath of development capabilities. You can’t use SharePoint Designer as a more general web-development tool. If you don’t have a SharePoint site to develop, then you have no need for SharePoint Designer (or, really, anything for it to work on). If you need a more general web-development tool, check out Microsoft Expression Web. 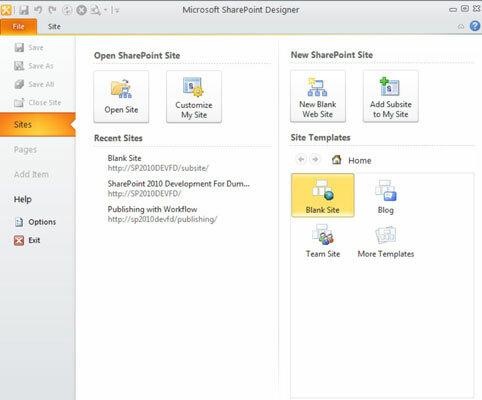 Expression Web is similar to SharePoint Designer, but it isn’t tied to SharePoint sites. You can’t write .NET code. When your SharePoint site calls for .NET code, switch to Visual Studio. SharePoint Designer 2010 works only with SharePoint 2010. If you are using Office 365, then you are in luck because SharePoint Online in Office 365 is based on SharePoint 2010. If you’re working with SharePoint 2007 (and not SharePoint Online, which is part of Office 365), install SharePoint Designer 2007 instead.